The folks over at iDownloadBlog (via iGen.fr) have just shared a handy little tip in iOS 10.1 beta, that lets you reduce motion while retaining the various iOS 10 iMessage features. Apple seems to have responded to a number of requests from beta testers, who wanted the ability to disable certain UI animations, but still wanted to be able to enjoy the new Messages app. Moreover, many users who had disabled motion dating back to iOS 7, found themselves not seeing these new iMessage effects after updating to iOS 10. Now when you enable Reduce Motion, and a secondary toggle will appear labeled “Auto-play Message Effects”. There’s also a new Replay button in the Messages app that allows you to force-play (or replay) an effect. 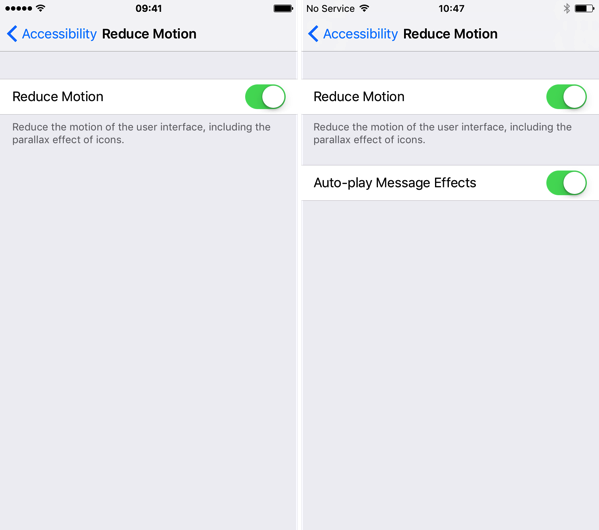 That’s it, you should now be able to Reduce Motion, while keeping Auto-play in iMessages to either On or Off.